Thread was formerly titled "Article about raising maggots on manure-feeding to livestock". Merged it with a similar topic and changed title to reflect discussion about regulations world wide. I wonder where that leaves the 'not feeding back to the same species' theory? It's my understanding that you can do that as long as you sanitize the larvae by cooking or some other process that will kill pathogens. They are obviously talking about housefly maggots, not even disease-free BSF. BSF don't like high-carbon waste like the straw and sawdust that they mention -- do housefly maggots eat those things? "It's my understanding that you can do that as long as you sanitize the larvae by cooking or some other process that will kill pathogens." They can't kill the prions causing Mad Cow Disease by cooking, so what's the plan for the maggots? BSE since 1986 -- what's next? They might be able to get away with "cross-feeding" maggots raised on manure (feed maggots raised on cow manure to pigs, from pigs to chickens, from chickens to cows, for example), but as obsessive as the human race is to place profit over health and safety, it makes a person wonder, doesn't it? Here in the U.S., our USDA is extremely lax about enforcing their own rules. I don't see an issue with using house flies in a controlled environment where disease would not be an issue. House fly larvae are already being raised in sterile conditions for use in medical applications such as removing dead flesh from burn victims. House flies normally carry disease because they travel back and forth between humans, their food, and contaminated materials like carrion and rotting food. In the absence of that cycle they shouldn't be any more prone to carrying disease than BSF are. I don't see a correlation with mad cow disease which is caused by feeding mammalian byproducts to ruminants. The larvae are being fed grain/grass which has passed through a cow, but that's a lot different that a cow eating other mammals. On the other hand, I'm not sure about the effects of feeding larvae to herbivores, but I hope the scientists haven't failed to consider that. "I don't see a correlation with mad cow disease..."
Mankind, the medical professionals and the scientists don't know everything -- that's my problem. BSE, GMOs, etc -- assumptions are made that everything is fine when it's not. For one thing, you know sure as 'hell that the flies in manure-feeding aren't going to be in much of a controlled environment. People wonder how E-Coli gets into our farm produce; I'll tell you: if you go to a large commercial production farm and walk up and down the rows of vegetables and fruit, you will see human feces between the rows. Third-World workers are paid by the collection unit (a box or crate or flat), and they lose money if they waste time trudging all the way to the portable toilets at the far edge of the field. BSE comes from feeding animals to animals. Feeding cow-waste-raised maggots to cows increases the likelihood of infecting the feeder cows with whatever the donor cows had, parasites or whatever. That is the main issue at this time. Things may change. These people know about BSF, which don't carry disease, so that would seem to be a safer course, but they're going (once again and forever, with cheap and profitable, screw the dangers. Has anything about the American food industry impressed you with their care, custody or control? I'm happy to see fly larvae being considered for helping make food production more efficient. It can be managed well or poorly, much like the example you gave. While another pioneering company, South Africa's AgriProtein Technologies, is rearing house flies and using insect flour for cattle feed, this is not allowed in the European Union where the "mad cow" disease crisis of the late 1990s has led to caution over the use of processed animal proteins (PAPs). "... At present, EU law prohibits the inclusion of protein derived from insects in animal feed, with the exception of feed intended for fish or shellfish. As evidence of efficacy and safety of insect protein increases, through research delivered by the EU-funded PROteINSECT and other research projects, it is hoped that insect protein will also be permitted in pig and poultry feed in the future, particularly as these animals already consume insects as part of their natural diet." There's a bit more information about the specific EU regs at the bottom of this post (link) by "StVitus"
...I would say to make sure that if you want to commercialise any of your production, you will need to make sure you meet the EU regs given by EC 1069/2009. I had to go through some lengthy discussions with the FSA before the trial could go ahead. I think things will become more relaxed in the future, though. There are links to some of the EU regs in this post (link) by "StVitus"
I know this thread is dead but I just wanted to say that prions come from the brains of animals, so you cannot transmit prions through manure. 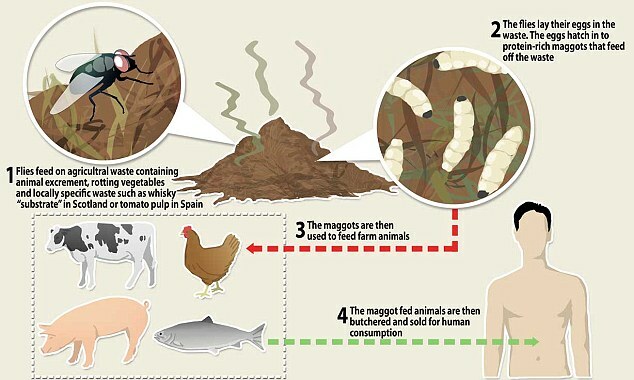 If you were feeding maggots on meat processing offcuts and then to cows again then you would have a problem, but feeding maggots to pigs and chickens would be natural. As you point out the danger may be in feeding animal by products back to the species of origin but so far there's no definitive science that I know of related to BSFL in this aspect. Changed the title of this thread to "Regulations regarding feeding insects to livestock" to reflect the worldwide nature of this discussion. “From what we can see, there’s no red flags,” Marchant said. The application is just slowly going through the process, he said. Redford’s business is also stalled by regulation. She received a polite letter from the CFIA saying her website implied Ofbug was selling insects as feed for livestock, and that bugs are not an accepted commercial feed ingredient. Currently, EnviroFlight sells its product to select zoos and pet food distributors." "An EU regulation approving the use of insects for protein in aquaculture feed came into play on July 1, according to the International Platform of Insects for Food & Feed (IPIFF). EU regulation 2017/893, which permits the use of insect proteins as fish feed, applies to seven species, the black soldier fly, common housefly, yellow mealworm, lesser mealworm, house cricket, banded cricket and field cricket. These should have been fed with ‘feed grade’ substrates, such as vegetal origin materials or with a limited number of animal origin materials, including fishmeal, blood products from non-ruminants, egg and eggs products, milk and milk based products, honey or rendered fats, according to the regulation. “IPIFF and its members are particularly pleased with the opening of this legislation. In our view, it constitutes a major milestone towards the development of the European insect production sector," said Antoine Hubert, IPIFF president." Gross that they are letting people use regular house fly!